The stars are well known for their roles on Call The Midwife. Source: Facebook/Call The Midwife Official. They are best known for their roles as the much-loved midwives on hit 1950s drama series Call The Midwife, and now the leading stars of the latest series have transformed off camera. 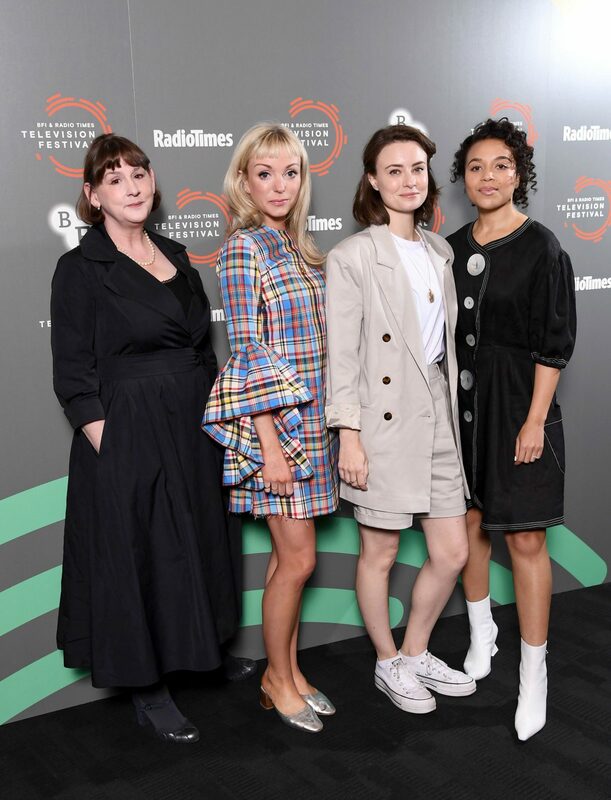 Helen George, Jennifer Kirby and Leonie Elliott, who play Trixie, Valerie Dyer and Lucille Anderson in the show, posed together in some stylish outfits to mark the 2019 BFI & Radio Times Television Festival. They were joined by creator and writer Heidi Thomas as they represented the hit series during a series of photocalls. Trixie actress Helen, 34, looked stunning in a multi-coloured chequered dress which fell above the knee and finished with statement large sleeves. (L-R) Heidi Thomas, Helen George, Jennifer Kirby and Leonie Elliott. Source: Getty. Showing off a new hairstyle off camera, the actress revealed a dramatic short fringe and wore her locks loose over her shoulders. She completed the look with some stand-out silver pumps. Meanwhile, Jennifer, 30, kept things casual in a stylish beige coat over matching long shorts and a simple white top – matching it up perfectly with some white Converse-style pumps. And standing beside her, Leonie, 30, opted for a loose black dress with huge buttons down the front – with all the outfits a far cry from the actress’ on-screen looks. Helen George plays Trixie in the series. Source: Getty. Meanwhile, Helen recently opened up to Radio Times about starring as Trixie in the long-running series – revealing only death would stop her playing the much-loved part. Meanwhile, writer Heidi reportedly told fans at the festival that nuns she has spoken to were “vexed” that the show hadn’t led to a rise in women taking the veil. Are you a fan of Call The Midwife? Who’s your favourite character?